Amidst the G-20 summit held in Argentina on Nov. 30, the host country opened an inquiry into criminal charges against Saudi Arabia’s Crown Prince Mohammed bin Salman. The potential charges include human rights abuses, namely the torture and killing of Jamal Khashoggi, as well as war crimes committed by the Saudi-led coalition in Yemen’s civil war. Human Rights Watch petitioned the Argentine courts for a criminal investigation, working alongside other advocacy groups, nonprofits, and international organizations currently pushing countries to cease military engagements that fund and supply Saudi Arabia’s war in Yemen. In late October, following Mr. Khashoggi’s death, German Chancellor Angela Merkel announced that Germany wouldn’t approve new arms exports to Saudi Arabia. On Wednesday, Nov. 28, the U.S. Senate voted 63-37 to move forward with a resolution to end American support for the conflict in Yemen, directly opposing President Trump’s continued support for the Saudi government. Senator Bernie Sanders said of the War Powers Resolution, “No question, we have more support than we have had before. The American people and members of Congress are learning about the brutality and dishonesty of the Saudi administration based on their murder of Khashoggi.” Even if this measure is passed, the war in Yemen is likely to carry on without political resolution between the various players involved in the conflict. UN-brokered peace negotiations are scheduled for later this week, likely on Dec. 3, between the Houthis and Yemen’s General People’s Congress, which is backed by the Saudi government. The international push for peace talks has grown in light of fighting over the critical Yemeni port city of Hodeidah, which is a key gateway for humanitarian aid entering the country. Martin Griffiths, the UN’s envoy to Yemen, is trying to ensure that all warring sides will attend the talks and allow for the UN to take control of the port. 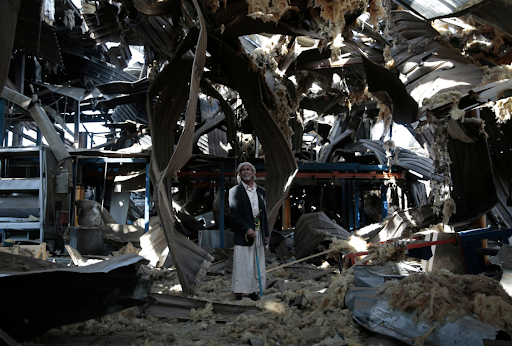 Peace talks have repeatedly fallen through, and the Houthis fired ballistic missiles into Saudi Arabia on Wednesday, Nov. 28 after saying they would stop such attacks on Nov. 18. There is also continued combat on the ground making hopes for a political solution grim. But the worsening humanitarian conditions in Yemen make diplomatic efforts to end the conflict a time-sensitive matter, although a quick resolution is essentially impossible. The International Rescue Committee reports that more than half of Yemen’s health care facilities have been destroyed, access to ports is being restricted, and there may soon be a new wave of cholera epidemic. In light of this crisis, international organizations must continue to pressure countries to stop taking part in the war, and efforts to reach a political agreement between the various actors must continue.